A layer of melted white chocolate with some peppermint extract and crushed candy canes - then chill. 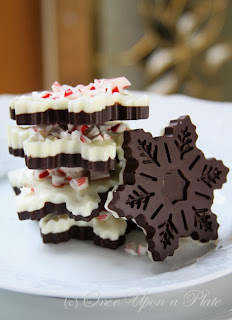 Then a layer of dark chocolate with peppermint extract and crushed candy canes. Chill then remove! I made snowflakes and trees since those were the molds I had. I packaged them up and sent them to work with Joe and got some good reviews. A couple days later I tried the recipe for soft sugar cookies that Shannon tried here. The came out great but unfortunately I forgot to take pics. I also used this tutorial for the icing. The frosting was tasty but I didn't quite master the piping part (so its probably best that I forgot to document!). Anyway to conclude - I will probably make the bark again next year. It was well received and was super easy to make. Plus I think it looks nicer (and makes less of a mess) then traditional broken up bark. 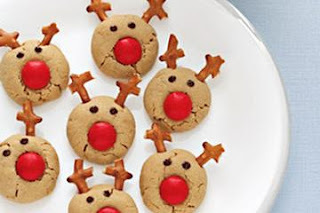 Of course my reindeer and chocolate chip cookies will be repeated as well - they are timeless. Hopefully I have time to make the sugar cookies again so I can show you some pictures (and master the piping) - maybe Valentine's Day! This wraps up all things Christmas here. I hope everyone had a great Holiday and fun New Year! These look yummy! 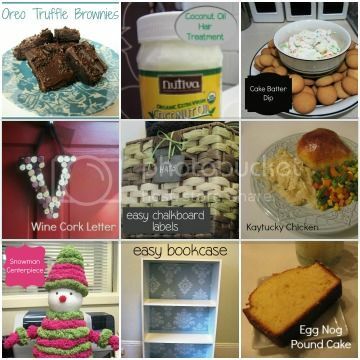 Thank you for linking up to my party! Thanks Julie! I just linked up.